The word derives from the Scottish Gaelic (and Irish) càrn which has a much broader meaning, and can refer to various types of hills and natural stone piles. The term tends to be used most frequently in reference to Scotland, but is used elsewhere. Cairns can be found all over the world in alpine or mountainous regions, and also in barren desert and tundra areas as well as on coasts. Starting in the Bronze Age, cists were sometimes interred into cairns, which would be situated in conspicuous positions, often on the skyline above the village of the deceased. The stones may have been thought to deter grave robbers and scavengers. A more sinister explanation is that they were to stop the dead from rising. It is noteworthy that there is a Jewish tradition of placing small stones on a person's grave whenever you visit, as a token of respect. (Flowers are not usually placed on graves in the Orthodox Jewish tradition.) Stupas in India and Tibet etc. probably started out in a similar fashion, although they now generally contain the ashes of a Buddhist saint or lama. In Scotland, it is traditional to carry a stone up from the bottom of the hill to place on a cairn. In such a fashion, cairns would grow ever larger. An old Scots Gaelic blessing is Cuiridh mi clach air do chàrn, i.e. 'I'll put a stone on your cairn'. In the Faroe Islands (which are plagued by frequent fogs and heavy rain, and have some of the highest seacliffs in the world) cairns are a common navigational marker over rugged and hilly terrain. In North Africa, they are sometimes called kerkour. Cairns are also common on the Mediterranean island of Corsica. Today, cairns are often used to mark hiking trails or cross-country routes in mountain regions at or above the tree line. Most are small, a foot or less in height, but a few are built taller so as to protrude through a layer of snow. A large cairn was built atop a hill next to I-476 in Radnor, Pennsylvania, to symbolize the area's Welsh origins and to beautify the visual imagery along the highway. 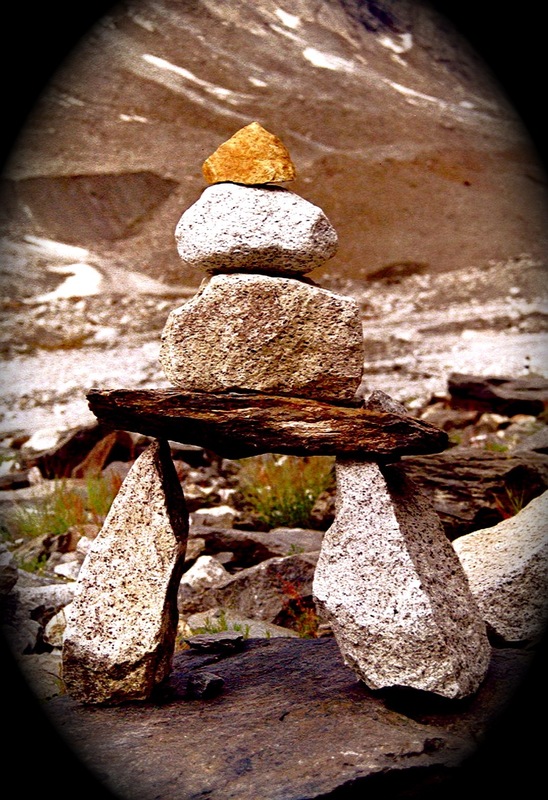 It is traditional for each person passing by a cairn to add a stone, as a small bit of maintenance to counteract the destructive effects of severe winter weather. Often the habit is to only add to the top, and to use a smaller stone than the previous top stone, resulting in a precarious stack of tiny pebbles. In Scandinavia, cairns are still used as sea marks. They are indicated in navigation charts and maintained as part of the marking system. To increase visibility they are usually painted white.